This Castle Ravenloft board game review was made after playing the game six times. Dungeons & Dragons: Castle Ravenloft is a cooperative dungeon crawl board game in which you will go on different adventures inside of Count Strahd’s castle and attempt to take out monsters and complete objectives. This game – and all of the D&D board games that followed – was designed to give players a Dungeons & Dragons(-ish) experience in an hour or less. Castle Ravenloft is published by Wizards of the Coast and was designed by Rob Heinsoo, Peter Lee, Mike Mearls, Bill Slavicsek. All of the adventures in Castle Ravenloft have their own win conditions. Once you’ve read the setup instructions and what you need to do to win, you’ll choose heroes, place the heroes on the starting tile, and then you’re pretty much ready to go. Each character has his or her own stats and a special ability, as well as Power Cards that give you even more unique abilities. You’ll have Armor Class (AC), Hit Points (HP), Speed, and Surge Value stats written on your Hero Card. If you ever have zero HP at the start of your turn, you’ll need to use a Healing Surge and gain health equal to your Surge Value. Your team gets a total of two of these tokens to use per game. During your turn, you can move and attack, attack and move, or move twice. You’ll attack by choosing one of your Power Cards to use, rolling the die, and adding any bonuses given to you by your Power Card. If you’re able to meet or exceed the enemy’s AC, then you’ll do damage. When you defeat a monster, you get the experience points written on its card as well as a treasure card (these give you more special abilities). Later on you can use your experience to skip encounters or even to level up your character if you’re lucky enough to roll a natural 20 during an attack. If you finish your turn at the edge of a tile with an open edge (no wall), you’ll explore. When you explore you add a new tile, draw a monster card, and place that monster’s miniature on the new tile. After you’re done taking your actions, the Villain Phase will begin. If you didn’t explore on your turn, you’ll draw and resolve an Encounter card, which is pretty much always a bad thing. After that you’ll activate any of the enemy cards in front of you and follow the instructions on their cards. If you’re able to complete the objective for the adventure you’re playing, everyone wins! You’ll lose if a character starts their turn with zero health and there are no Healing Surge tokens left. Most adventures will also have additional ways you can lose. This might just be the best gateway dungeon crawl system I’ve seen. I had a chance to play this with someone who had never played a modern board game and she understood almost all of the rules by her third turn. It’s extremely easy to learn and teach. The characters all feel quite different thanks to their special abilities and Power Cards. Each one helps the team in his or her own ways, giving players slightly different approaches to the adventures. There is a very nice flow to this game. Turns are extremely quick, so there’s very little downtime regardless of player count. The miniatures are fantastic and help to bring the game’s theme to life. There’s a nice mix of easier to very challenging adventures to go on. There aren’t too many other dungeon crawl board games that can be completed in an hour or less. Some people will not like that they will have to rely on good dice rolls to do well in Castle Ravenloft. It’s very much a luck-based game, so you’ll probably want to pass on this one if that bothers you. The dungeon tiles are a bit bland looking. That helps to make the miniatures stand out, but the board doesn’t look great when there are fewer characters on it. You only need the one d20 that is included in this game, but more probably would have been better. Maybe one for each hero and one for the enemies. 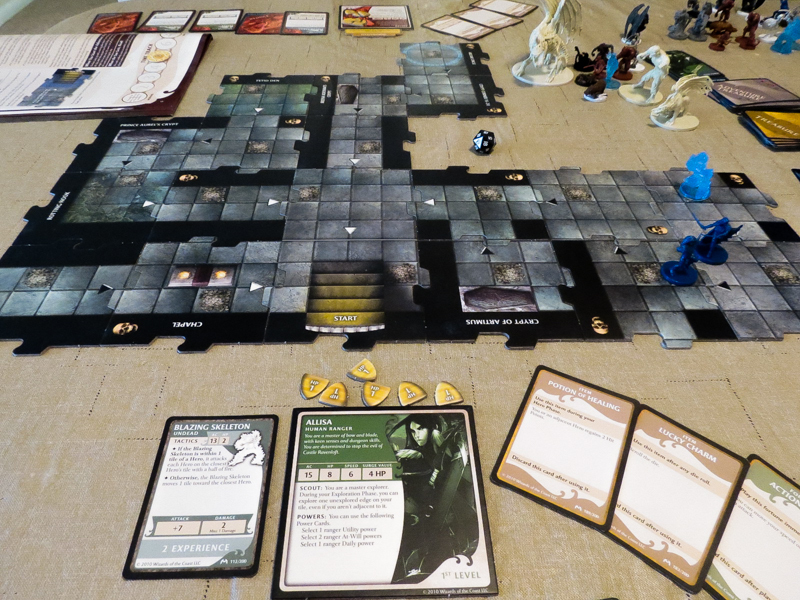 This Castle Ravenloft board game is a solid, easy-to-understand dungeon crawl for gamers of all ages. It’s certainly not a deep game, but that actually makes it more fun for those who just want to jump in and have a good time without having to keep track a lot of information. In my opinion, it’s a bit underrated on BGG (something I haven’t said about too many other games). 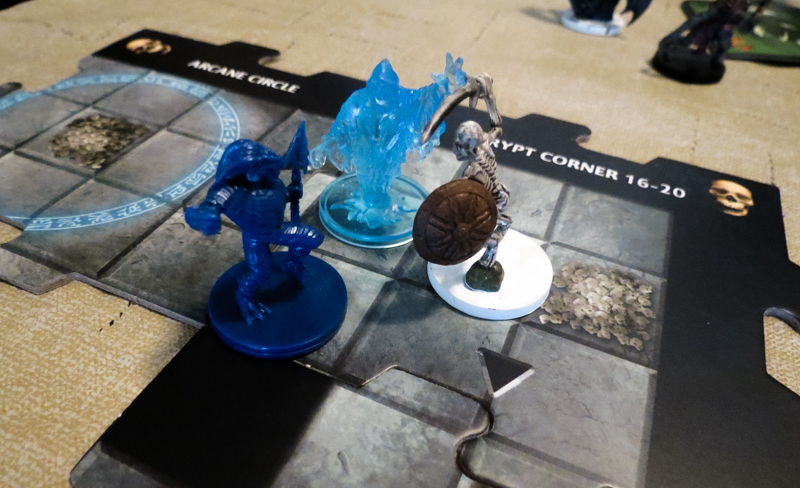 Castle Ravenloft and the other Dungeons and Dragons board games are fantastic for people who are looking for a cooperative dungeon crawl that is easy to learn and that has a lot of replay value. It works very well as a family game, too. You’ll want to pass on this one if you don’t like dungeon crawls or if you prefer meatier games. 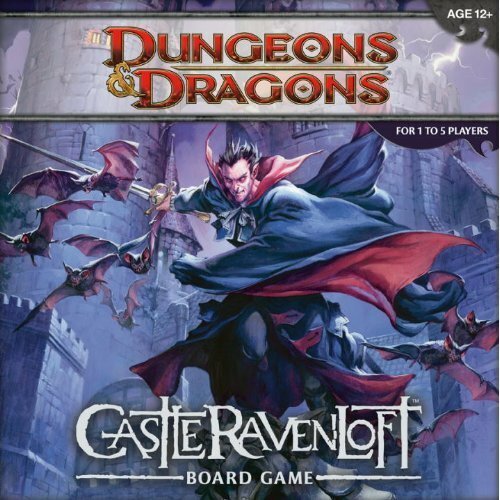 Thanks for taking the time to read our Castle Ravenloft board game review! To stay updated on all things cooperative board games, follow us on Twitter, Facebook, or via RSS.